For monitoring behind the firewall, in your local networks, data centers, or even remote locations. 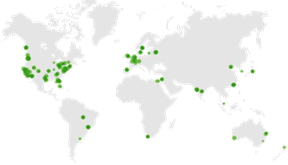 Monitor your digital assets globally, from our network of over 350 nodes. Monitor internally and externally, for full visibility into your digital performance. Best of both worlds: internal and external monitoring. Hybrid Deployments are tailored to fit the specific needs for both internal and external monitoring strategies. Interested in seeing how we stack up? In most cases, AlertSite is runs alongside APM tools like Dynatrace, New Relic, and AppDynamics so that teams can have a constant pulse on their performance in production. AlertSite's Synthetic Monitoring & Alerting is unmatched in APM and API Management tools on the market today.